Premium Universal LCD & Plasma TV Wall Mount Bracket with Dual Arm, Dual Pivots (100kg) + FREE SHIPPING! Super Heavy Duty Design for the largest screens! This is it. You've just hit the big time. You're about to walk out on stage and share the spotlight with the biggest, baddest and most versatile home entertainment facilitator known to mankind. 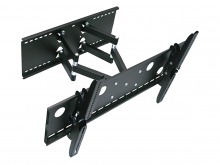 The Premium Universal LCD & Plasma TV Wall Mount Bracket with Extendable Dual Pivot Arm is the ultimate heavyweight contender; able to support a titanic 100 kilograms of television (I'm talking 70 inches or more) and still give you all the swivel, tilt, extension and rotation action as my other brackets. The 2mm steel construction is nearly bulletproof, and works overtime to keep your pride and joy up off the floor and secure on the wall. Once installed, you can also secure the television mounting arms to the bracket with your own lock for extra safety. After that, it offers a full 15 degrees of vertical tilt both up and down. It then gives you a dual set of extending arms that have a range between 105mm and 500mm from the wall - plenty of space for all your cabling needs after the television is mounted. When extended, you're given up to 45 degrees of horizontal pivot left and right (or until your massive television touches the wall). All in all, this is a mighty hammer which you can use to strike down and smite the evils of floor standing cabinets, poorly designed television stands and the risk of scratching your built-in shelving units when constantly shifting your television to get the best angle. It works just as hard in your home theatre as it will in a commercial or industrial setting, and the installation will be just as easy no matter where you put it. Please note: Due to the weight capacity of this heavy-duty mounting bracket, a timber stud is essential for proper, safe mounting. If you have a particularly large/heavy television and intend to operate it at the fullest extension of the arms, consider reinforcing your wall to be sure it will cope with the weight. Screen Size: 42" to 80"
Need help choosing a wall mount to suit your TV? Check our handy Guide! Recommended for screens 42" to 80"
Please note: As with all wall and ceiling brackets, a timber stud or beam is essential for proper, safe mounting. Due to the size of this item, Express Delivery may not be available. I recently purchased a LCD TV wall mount bracket from Cable Chick. I could not have asked for more! The best products at the best prices from an amazing company speedily delivered to your doorstep. Done! This products tilt option along with the weight rate sealed the deal for me. All and more that a TV bracket should be. Since buying the TV bracket I have returned to kit out my home theatre at a fraction of the price from the leading high street retailers. I have also recommended all my friends to check this site out before any future purchases. I will definitely be returning a satisfied customer. Cheers Cable Chick! I recently purchased the swing away wall mount for my LCD and it is awesome! It was simple to put together and has the best adjustment of any wall mount that I have found. All good and prompt. I will definitely pass on the good service you provided to other people. Thank you again.